Kahuna is a large sea turtle that experienced a shark attack rendering her defenseless in her normal habitat, the Atlantic Ocean. 60% of her left front flipper was lost with deep lacerations on her right flipper. 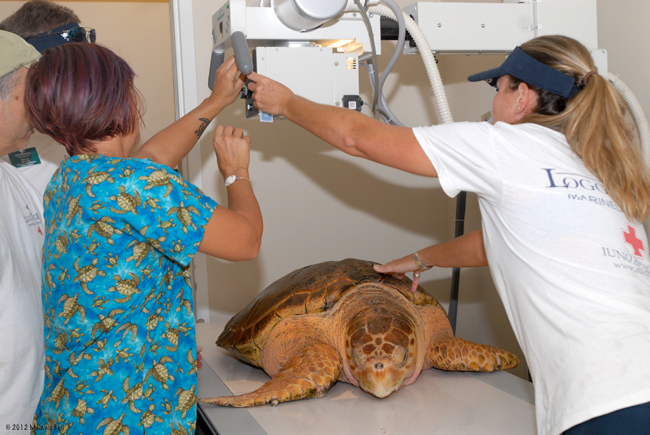 She was rescued by the Loggerhead Marinelife Center in Juno Beach, FL. The Center is a pretty amazing rehabilitations center wequipped with state-of-the-art medical equipment and medical professionals. Kahuna has been at the center in treatment since rescued and the Center partnered with the Equine Hyperbaric Center of South Florida at Reid and Associates in Loxahatchee, Florida to provide 18 hyperbaric oxygen therapy treatments for Kahuna’s benefit. These were very successful and now Kahuna is healthy enough to reutrn to her home in the Atlantic Ocean. Release is scheduled for 10:00 a.m., Saturday, July 7th on Juno Beach right across the road from the Center. A crowd is sure to be there cheering Kahuna and Loggerhead Marinelife Center as Kahuna is freed and disappears into the great blue waters! !